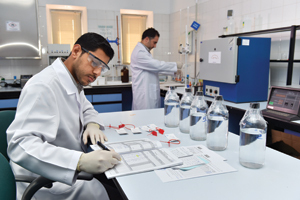 Bahrain-based Gulf Petrochemical Industries Company (GPIC) had exported a total of 1.23 million tonnes of ammonia, urea and methanol in 2017, representing an increase of 4.2 per cent over 2016, says its President, Dr Abdulrahman Jawahery. 'GPIC’s exports by product showed 454,667 tonnes of methanol, 6.3 per cent over 2016, 709,791 tonnes of urea, 3.9 per cent over 2016 and 74,021 tonnes of ammonia, 14 per cent more than what we planned to export during the year. 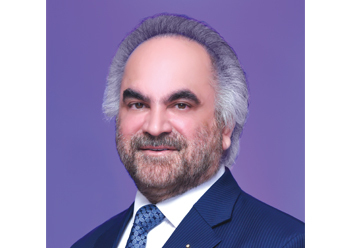 The products were shipped by 73 vessels to their final destination,' says Dr Jawahery in an exclusive interview with OGN. In 2018, GPIC will carry out a total plants turnaround after being in operation for almost three years continuously. Hence, the projected production and exports are expected to be less compared to 2017. 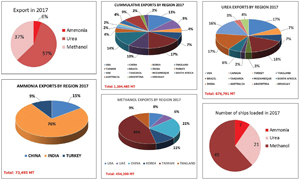 The total planned production of ammonia, urea and methanol in 2018 will be 1.48 million tonnes, out of which 1.12 million tonnes will be available for export, he says. Referring to GPIC’s export markets, he says the traditional markets have witnessed a dramatic shift and the company is exploring potential new emerging opportunities and customers coming to the front from a number of key regions around the globe. Markets like Taiwan, India, US, Brazil and countries in East Asia have shown sound and growing trends in imports for GPIC’s products, whilst more traditional markets have witnessed an internal consolidation of their imports in general, resulting in a shift in market purchasing patterns. For GPIC, Taiwan has the highest share of the company’s exports in 2017 with a 17 per cent followed by India and US by 14 per cent and 12 per cent respectively. All this, has been achieved smoothly and without hindrance and in accordance with the marketing plan and contractual obligations, also the employees who have a relentless pursuit and commitment to optimum professionalism in spite of an unstable global market and low oil prices. Referring to capex projects, he says the 22 metric tonnes per day (mtpd) urea formaldehyde (UF85) unit was awarded to JGC Gulf International Company, Saudi Arabia, for a lump sum cost of $13 million. Actual production is expected to start during the third quarter of 2018. The project will contribute to securing GPIC’s chemicals requirements for the manufacturing process of granular urea. The unit will manufacture urea formaldehyde, a necessary and key component in the production and manufacture of urea granules. (GPIC currently imports this from other countries). Also, a new cryogenic nitrogen unit with a capacity of 950 Nm3/hr is being installed to meet the additional demand of nitrogen. The plant is expected to start production of nitrogen by March 1, 2018. What were the highlights of GPIC’s performance in 2017? In 2017, GPIC continued to build on its success and received recognition for its relentless and driven attitude towards sustainability, corporate and social responsibility and beyond excellence results. In order to remain competitive in the challenging global market, GPIC revised and updated its 2020 Corporate Strategic Plan incorporating it completely into GPIC’s forward-looking 2030 Corporate Strategy. The continuing market instability and global economic downturn during 2016 and 2017, combined with escalating energy costs, provided GPIC’s leadership with a golden opportunity to initiate new and bold innovative business strategies for optimising the company’s processes and overall business approach. Despite a global volatile economy, GPIC continued to ensure its operational excellence and production achievements as well as maintain all its plants to the highest levels of safety, productivity and reliability. 2017 was another extremely successful year for GPIC in terms of Safety, Security, Health and, Environmental (SSHE) excellence. These continual improvement efforts have continued to enhance our behavioral safety culture and has culminated in us achieving a record 27 million working hours for its workforce and contractors without any lost time accident this past year. GPIC was recently awarded with the coveted ‘Her Majesty Queen Elizabeth II Gold Category (RoSPA) Award and more recently the Company received the Saudi Arabia Award for Environmental Management in the Private Sector. During September 2017, some of the world’s leading experts in the fertiliser industry visited Bahrain to take part in the 8th Gulf Petrochemical and Chemical Association (GPCA) Fertiliser Convention. The event was held from September 26 to 28, 2017 in Bahrain and hosted leading industrial leaders from the Gulf and beyond. Participants discussed important issues, including the potential impact of changes in fertiliser trade; key factors of future growth and, topics related to creating a stable environment, recreating global distribution channels and, linking innovation to business. The Convention showcased the latest and most important regional and global technological developments in the industry. The event was the first of its kind in the Middle East and was aimed at enhancing the role of companies and their potential ability to play a key role in global chemical industries and ensure sustainable industrial growth. As per new government regulations, all companies operating private jetties in the Kingdom of Bahrain are required to acquire a licence from the Bahrain Government. GPIC successfully acquired licence for its Urea Marine Terminal in the first week of July 2017. What was the total production target for 2017? What was the capacity utilisation at all the three plants? What have been the production trends for GPIC in terms of all three products? • The monthly urea production of 62,300 tonnes for January 2017 was the highest ever achieved. • The daily urea production of 2,055 MT on December 12 was the highest ever. • The urea plant completed 933 days of continuous production run. • The ammonia plant completed 804 days of continuous production run. • The methanol plant completed 576 days of continuous production run. As you know, GPIC is at the forefront of its drive for state of the art technology and its approach to supreme maintenance for its operations. Production performance in terms of the on-stream factor and utilisation factor, also reflects the high levels of safety, stability and productivity maintained over the last ten years for all three GPIC plants. This performance is attributed to the rigorous maintenance and inspection programmes practised by GPIC. GPIC’s strict preventive, corrective maintenance programme and intensive inspection regime, supported by ideal operating procedures contributed in the company achieving a consistently high utilisation factor for all plants and an on-stream factor of 99 per cent and above. As a result, in 2017, GPIC was able to achieve a total production of 1,604,725 metric tonnes of ammonia, urea and methanol. What were the export statistics for 2017? How does it compare with 2016? What is the projection for 2018? Owing to the close cooperation with our marketers at Saudi Basic Industries Corporation (Sabic) of Saudi Arabia and Petrochemical Industries Company, Kuwait, GPIC was able to enjoy smooth export operations of the company’s products. In 2017, a total of 1.2 million metric tonnes of products were shipped on board 73 vessels. As part of GPIC’s commitment towards encouraging and supporting Bahrain’s economy, methanol tanker loading was initiated on December 25, 2016 for local sale. This progressed very well during 2017 resulting in a total of 1,196 MT methanol being sold in that year. The methanol sold in Bahrain is used in the downstream industry thus boosting the sustainable development of the country. What is GPIC achieving in terms of sustainability and the environment? GPIC is not only a market leader in business but a well-known champion in sustainability. Through the years we have scaled up the sustainability practices and initiatives and currently lead in a number of ways. Our focus on sustainability initiatives continues to be in leadership, collaboration and innovation. Like other responsible businesses, GPIC too has directed its focus onto the Sustainable Development Goals and has proactively started to review, link and align its business priorities with the global priorities as articulated in the 17 Sustainable Development Goals. As a first step, we have shown our alignment to the global goals by linking our long term sustainability goals to the SDGs. We have also started engaging the youth of our company and Bahrain through awareness campaigns on SDGs. GPIC’s leadership commitment and support for sustainable agriculture, food security and poverty eradication and its engagement with international organisations such as UNGC, UNEP, FAO gained significance and further momentum throughout 2016 when GPIC’s president became the International Fertiliser Industry Association (IFA) president. GPIC’s president is also an active member of UNEP’s HLG for GEO 6 and provides guidance and policy position on regional assessments. What was the cost of capex projects undertaken by GPIC in 2017? What were the main projects undertaken? 2017 was a challenging year for all industries, however GPIC maintained its commitments in terms of maintenance, modifications and new specification technologies as it gears up for the company’s major turnaround in 2018. Major approved Capex Projects during the upcoming Turnaround 2018 are well under way and will no doubt, facilitate in enhancing the safety and reliability of our process plants. This year our engineering department completed around 200 modifications arising from rigorous Process Hazards Assessments conducted by the division. GPIC has continued its major investments in various projects, including those that contribute to the preservation of the environment, such as the Carbon Dioxide (CO2) Recovery Unit, which was successfully commissioned in December 2009 to contribute to the limitation of CO2 emissions. The CO2 Recovery Unit currently recycles around 450 metric tonnes daily of CO2 for reuse in plant operations. 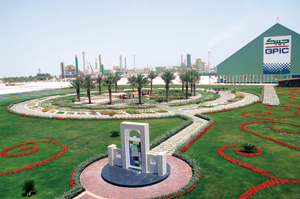 • The urea plant’s dedicated flare system project was commissioned in November 2012. Modification of the ammonia plant venting system was also commissioned during November 2012. • Installation of the new high-pressure boiler, new electrical substation and new hypochlorite unit was carried out in 2012 to enhance the plants’ safety features and requirements of steam and electricity, aiming to further improve reliability. During 2017, GPIC undertook a series of targeted cost optimisation projects initiated by every department across the organisation. This resulted in further enhancements to processes, systems and cost effective operational practices of the company. 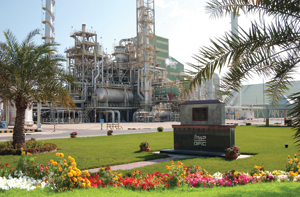 UF85 project: The contract for a 22 metric tonnes per day (mtpd) urea formaldehyde (UF85) unit was awarded to JGC Gulf International Company, Saudi Arabia, for a lump sum cost of $13 million. Actual production is expected to start during the third quarter of 2018. The project will contribute to securing GPIC’s chemicals requirements for the manufacturing process of granular urea. The unit will manufacture urea formaldehyde, a necessary and key component in the production and manufacture of urea granules. (GPIC currently imports this from other countries). The project reflects GPIC’s commitment towards ensuring the sustainability and economic efficiency of its operations and the effective use of natural resources, minimising its impact on the environment and, biodiversity. The unit will be designed and constructed for GPIC’s captive consumption, making the existing operation more reliable and eliminating any dependency on external agencies. The new unit will run at low and optimised costs to produce the critical raw material needed for Urea manufacture. New Nitrogen plant: A new cryogenic nitrogen unit with a capacity of 950 Nm3/hr is being installed to meet the additional demand of nitrogen on normal operations and during plant turnarounds. This nitrogen generator package system is supplied by ‘Air Liquid, Global E & C solutions’ who have extensive experience in air separation plants with over 3,500 plants built around the world. This new plant will utilise the standard cryogenic distillation technology, enabling the separation of air into one of its main component: nitrogen. The plant is being installed and expected to start production of nitrogen by March 1, 2018. The installation of the plant will improve the availability of nitrogen to GPIC’s methanol storage tanks and other critical equipment during maintenance downtime of the existing nitrogen unit. What were the tasks undertaken by the maintenance department in 2016 to improve reliability? How many orders were undertaken for 1) preventive maintenance 2) corrective maintenance 3) modifications? In 2017, GPIC’s Maintenance Department continued its consistent efforts to enhance safety and reliability throughout the complex, placing special emphasis on the process plants. Accordingly, the objectives and key performance indicators for the department were set and monitored closely on a quarterly basis, resulting in the company’s objectives being achieved. • Refurbishment of boiler B-5201B [In progress]. How much CO2 is being treated daily after the commissioning of the carbon capture system at GPIC? In partnership with Mitsubishi Heavy Industries (MHI), GPIC hosted a technical conference on carbon dioxide extraction during the latter part of 2015. GPIC was the first company in the region to successfully construct its Carbon Dioxide Recovery Unit and employ such technology. The conference gave us the opportunity to share our extensive expertise and knowledge with the industry sector in this regard. Our organisation holds the protection and sustainability of the environment in the highest regard and we will continue to endeavor to share our capability with everyone in this sector and seek out the latest environment-friendly technologies in the petrochemical manufacturing process. Our CDR, which has been in full operation since 2009, has so far extracted over 750,000 tonnes of Carbon Dioxide, which has been used to enhance the production of urea and methanol. This translates to an average of 200,000 Nm3/day CO2 being captured by the CDR recovery unit. How did GPIC enhance and strengthen its Health, Safety and Environmental (HSE) management systems in 2017? What were the achievements? GPIC achieved well over 22 million accident free man-hours in 2015 and by the end of 2017, it achieved over 24.5 million accident free hours. The table top exercises conducted each year contribute to the company’s record of 24.5 million safe man-hours and no lost time accident days reaching 5,400 to date. • To date we have recycled 111 tonnes of plastic, paper, metal cans and card board. Additional waste recycling points were introduced in employee’s car park areas and the GPIC Club. This has resulted in a reduction of our carbon emissions by 190 tonnes.